The most creative cubbies in Brisbane will be on display and up for grabs over the Brisbane Open House weekend on 11 and 12 October 2014. The inaugural Grocon Great Cubby House Build supporting Kids Under Cover will capture every child’s dream with the joint venture design team from the Parklands redevelopment project – Archipelago, Arkhefield and ARM Architecture – each designing a cubby house which has been constructed by Grocon. 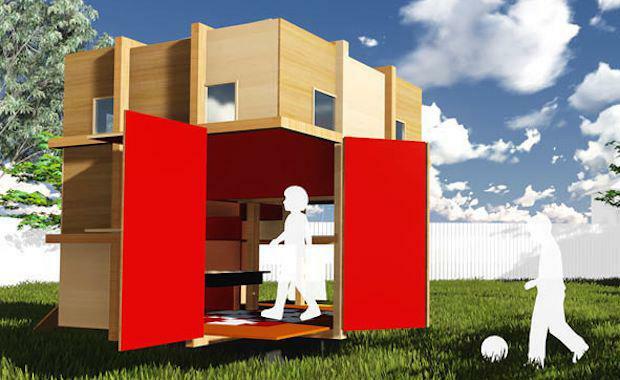 The cubbies will be displayed at the Brisbane Open House Information Hub at King George Square on the 11 and 12 October 2014, with two of the cubby houses to be sold in a live auction during the event and the third cubby house to be raffled. All proceeds will go to Kids Under Cover to support homeless and at-risk young people in our country. Queensland Government Architect Malcolm Middleton said Grocon’s Great Cubby House Build is about engaging with children and adults through fun and creative designs, whilst supporting a good cause. “In a Queensland first, we’re proud to be working with Grocon to support Kids Under Cover and the fantastic work they do helping vulnerable young people across Australia who are either already homeless or are at risk of homelessness. Grocon National Design Manager, David Waldren, said cubbies are places of imagination, dreams, sanctuary and adventure. “These cubbies offer the ultimate creative play zones for any child, or group of children, lucky enough to own one and are a great way of engaging children and encouraging their love for structures and design. “Kids Under Cover is a community partner we’ve been working with for many years and we’re thrilled to be leading the charge with a fun-filled fundraiser such as this to support the important work they do,” Said Mr Waldren. The Cubby House Build is just one of the many fun and engaging activities in the FREE Brisbane Open House Children’s Program supported by Grocon. Children will also enjoy the free Brisbane Open House Children’s activity booklet which is full of amazing sketches and activities by Brisbane’s best architects, landscape architects, artists and companies. Family friendly activities will be available at select buildings over the Brisbane Open House weekend and the activity booklet will be available at all participating buildings and the Brisbane Open House Information Hub at King George Square.